There is no telling how many times and ways that Charles Dickens’ “A Christmas Carol” has been adapted for stage and screen. 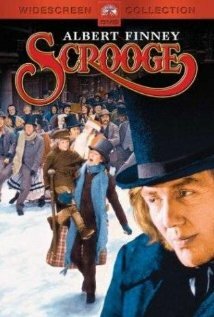 My favorite since seeing it — not long after its release in 1970 — is the film musical “Scrooge” starring Albert Finney. I suppose I’ve watched it a couple dozen times over the many years, sometimes horribly edited down and reduced to the old 4×3 screen proportion for television. Each time I see it, something about it becomes a little more treasured. The first time, it was the realization that Finney was a young actor playing Ebenezer throughout — in his twenties, in his thirties, and in his sixties/seventies — with a hunchback and wrinkled whomperjawed visage. Another viewing was the restrained performance of the Spirit of Christmas Present, an obviously mirthful Father Christmas-y fellow reduced to the task of reproving Scrooge by imitating his grumpiness. Still another viewing was the heartbreaking Leslie Bricusse song “You … you …” as old Ebenezer, split screen with his younger self, loses the love of his life. Obviously right in front of them, Fezziwig himself was having difficulty keeping up with the younger folk, doing the best he could — and still having the red-faced, howling-laughing time of his life even as he fell down from his missteps. But this year her question is haunting me as well. Never mind the childhood prohibitions on dancing from my dedicated Church of Christ parents; the notes that kept me from having to take the mandatory lessons at school; the hesitant attendance at a high school prom as a favor to a good friend without a date. I don’t dance because I’m not very coordinated, and I don’t feel confident at it, and … oh, any number of other excuses. I tried once. I really did. Angi and I were at an event, and after sitting patiently through a few numbers, she stood up and held out her hand for me. I took it, apologizing all the way to the dance floor, and after embarrassing both of us thoroughly, she forgave me and let us retire back to the dinner table. In the years after, I even thought about getting dancing lessons for myself as a gift for her. Yet I never did. As you might have guessed, this post isn’t really about dancing. Except for the obvious metaphor that life itself is a dance, whether you can do it or not, and it beckons you to join in the movement and the laughter and the joy of it. And I have not been dancing these last couple of years. So this dear old among-the-favorites movie has provided me with yet another moment to ponder and treasure. It’s given me a resolution for next year, for the rest of my life, for movement and laughter and joy. It’s time to join in the dance. When I was a graduate student in creative writing, we frequently had dances, and the saying was, “You dance like you write.” Generally speaking, I’ve found that to be true. Wow! I thought I was the only one who still loved this movie. In my mind, the Christmas season doesn’t begin until I watch “Scrooge”. Like you, I’ve watched it multiple times over the years. My wife and I saw it together in Dallas during the Christmas season of 1970. We were going to school at Abilene Christian. Over the years, I think my three sons, now grown, learned to hate the movie because of my obsession. Glad to hear that there is someone who loves it as much as me.